It’s almost time- my son is getting ready for another big birthday. As a very active little guy, it can be hard to know what to say when people ask for third birthday gifts for a boy. Toys don’t always entertain him, and he’s old enough to prefer items to play with over clothes. And frankly, we have limited space at home to store all those gadgets and gizmos galore. So what kind of presents should you get for a boy’s third birthday? Especially for a very busy little boy? I can tell you that with all the toys we’ve had and loved, these are- by far- the best gifts for three year old boys you can get to help celebrate a birthday or holiday. When you need to unleash some big energy inside, the Magic Moves wand has you covered. With easy to follow instructions even a three year old boy can understand, the Magic Moves wand will have your little guy hopping, jumping, and skipping around in style. Another winner at our house, this foam pogo stick is like having your own, tiny trampoline. Three year old motor skills are finally developing enough to let your three year old boy jump using both feet, and this foam pogo stick allows them to reach new heights- which, of course, they LOVE. We could do without the squeaker, if we’re being honest- but otherwise, this pogo stick gets a lot of play time at our house (and burns a TON of energy in the process). Whether your toddler boy loves the bath or hates it, finding some new bath toys is a sure fire way to make the act of getting them clean a little easier (and a LOT more fun). After a day of messy play, there’s no better way to wind down than with a nice, warm bath. 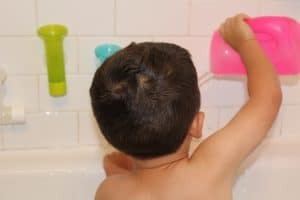 Check out our list of novel bath toys for some unique toddler boy gift ideas! By the time my daughter turned four, our collection of ride on toys was pretty insane. We had a scooter, a trike, a balance bike, a push car, a cozy coupe, and a ride-on car. In a fit of decluttering before my son was born, we got rid of every.last.one. Much to my regret, as I would soon find out that my toddler boy was obsessed with ANYTHING with wheels. So when I was looking for third birthday gifts for a boy, I stumbled upon this incredible, two-in-one ride on toy. 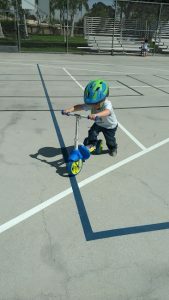 It easily converts from balance bike to scooter and bike again, and is the right height for two and three year old boys to reach the ground with ease. See how the two-in-one bike/scooter transforms here. And because it serves two purposes, it saves valuable floor space in the garage. If you’ve ever seen a three year old boy, you’ll know that they have some kind of biological imperative to JUMP. What better way to blast through some of that toddler energy than with a trampoline? Our favorite for inside is this model from Little Tikes. It’s the right height for the under five set, and comes with a handle to make their jumping a little bit safer. And if you’re ready to go big, check out this amazing, 7-foot trampoline made just for younger kids. It’s got a zippered enclosure for safety (and a not-insane price tag, either!). The best gifts for three year old boys nurture their newfound love for imaginative play. We’ve got tons of action figures around our house, but we realized he was gravitating towards his sister’s dollhouse as his super heroes’ home base. With a bit of digging, we found this KidCraft police and fire station that allows him to play pretend with his own little figures (without driving his big sister nuts in the process). It comes with a police officer, a fire fighter, and a vehicle for each. There’s even a little Firehouse Pet- a sweet little dalmation that Abram loves to play with. As a bonus, this Fire Station folds up when not in use (not quite flat, but definitely smaller). It doesn’t take up a ton of floor space, but still gives him plenty of space to play. My three year old has TONS of energy, but sometimes? I need him to be STILL. These Water Wow books from Melissa and Doug do the trick of letting him use his burgeoning fine motor skills over and over again (without needing a ton of help from mom). These are excellent additions to any busy bag or restaurant kit, and will keep your toddler boy busy for quite a long time. If you can’t make it to open gym at the gymnastics studio, why not bring a little gymnastics to you? These School Smart Stepping Buckets are the perfect way to practice gross motor skills even without a ton of equipment. Click to view pics of these stepping buckets in action. Let your child participate in setting up, stacking, and distributing the stepping buckets. They can make their own little obstacle course and practice leaping from one bucket to another. As a bonus, these work super well inside, but can also quickly become one of the best outside toys for toddlers, too. Toddlers and sensory play go together like peanut butter and jelly. They love to scoop, pour, and explore different textures and sensations. No where are they better able to do this than in a water table. We particularly like this two-in-one water table which can be used for either water or sand. It comes with an umbrella for shade and ton of little toys to keep your three year old boy engaged. And to top it off, it’s DINOSAUR THEMED. Now, tell me a three year old boy who wouldn’t love THAT. And you don’t have to limit your water table to holding water- if you’re feeling brave, it can serve as a perfect way to experiment with ice, water beads, or shaving cream, too. If you’re looking for REALLY special third birthday gifts for a boy, you have got to check out Tinkering Toddler Crates, made by a local Long Beach mom (with a toddler boy of her own). Tinkering Toddler Crates are designed to meet your little guy where he’s at, witch adaptable activities that are guaranteed to pique his interest. 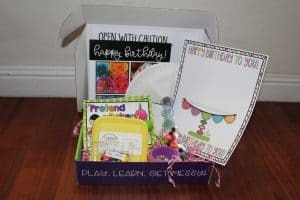 A typical crate includes several activities, from sensory play to crafts and art projects, and are hand selected to create the ideal experience for your toddler boy. Subscriptions are available for a larger gift, but you can also buy single crates. We particularly love the Happy Birthday crate, which is a stand-alone crate that makes for a PERFECT third birthday gift. 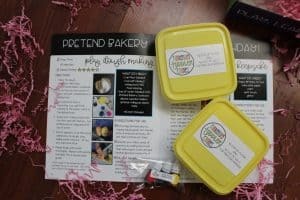 And for a limited time, our readers can get free shipping on their first kit using code THESALTYMAMAS5, bringing the entire gift down to $25 plus tax. And trust us- for the amount of magic in that crate, you can’t beat the price. So if you need third birthday gifts for a boy, these unique ideas should get you started. 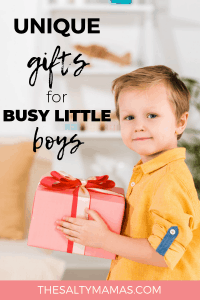 By harnessing their big energy and playing to their emerging strengths, these toddler boy gift ideas are sure to get big smiles from your favorite little guy. Looking for more gift ideas? Check out these posts next!